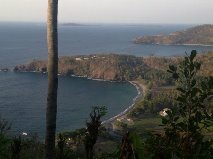 Medana Bay, Beachfront, 2.5 hectares (very near Sire Bay), just across Oberoi and one block from Lombok Lodge. Pandanan Beachfront, 1 hectare, about 15 minutes drive from Senggigi. Malimbu Hill, sunset point, 5 hectares. Details of Malimbu Land, the hill is also called Sunset Point at Malimbu. Location is about 10 mintues drive from Senggigi. The hill is only about 6-7 metres high and the view from the hill is breathtaking. Total area: About 5 hectares. Suitable for development of high end villa estate.